Is underwater photography difficult? Actually, no—at least, not to any significant degree when compared with any other discipline of photography. 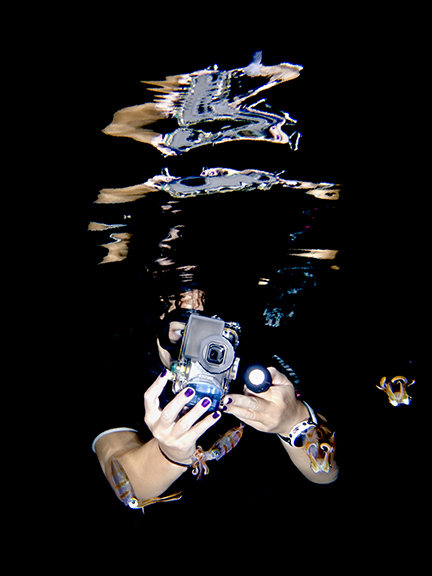 Each single stage of creating an underwater photograph, if seen in isolation from the rest, is not so tricky. It is the sum of all its parts, as well as mastering the whole, which can appear confusing at times. It is often believed that professional photographers have “special secrets,” which make their shots stand out from the rest, but mostly, it is rather a question of following a proper mindset. In terms of underwater photography, we can say that the mindset is the systematic approach to staying organized and getting the best out of our photo dives. If you, for example, tend to run around your hotel room, searching for your housing’s o-ring in the last stressful minutes before the departure of the dive boat, while at the same time, wonder about whether or not you have charged your strobe batteries (and where are those batteries, by the way? ), you could definitely use a change of mindset. Say, you are planning to join a dive boat trip for two to three photo dives the next day. Thinking ahead about things before they happen, and not when they happen, is an important first step. Location. Before assembling all your photo gear, consider first where you are going to dive and what kind of conditions you will find there. Is it a dive spot for shooting macro or a wide-angle? Is there anything particular you plan to take photos of, such as special critters or a wreck? Is it deep or shallow? What are the general light conditions, such as the position of the sun? You can obtain this information from the dive center, dive guide, other photographers with knowledge of the dive site and if all else fails, do a little research on the Internet. With this information in hand, you can choose the appropriate equipment configuration for the task at hand, such as which lens to use as well as strobes, strobe arms, etc. Ideally, you have dived the spot before and have prior knowledge of what is down there—maybe even taken some test shots to develop an idea—and now, you are going back to take the shot you want. For underwater photography, it can be highly advantageous to dive the same place multiple times. Equipment. Having decided on what equipment and camera rig configuration is needed for the task ahead, the next step is to collect all the required parts and place them on a clean, dry and dust-free surface. This could be a table or even the bed in your hotel room. •	Spare batteries for both camera and strobe(s). Take your time when assembling your photography gear. Do this methodically and calmly, and without being distracted. Ensure that all batteries are fully charged (also the spare ones), the memory card is empty (or still has lots of free space), and all o-rings are smooth (lubricated) and clean. Once this is all done—a quick job for compact cameras, but sometimes a bit more comprehensive for a dSLR or mirrorless systems—do a few test shots to make sure that your camera and strobes are working correctly. If something is not functioning properly (e.g. the strobe is not firing) you now have the opportunity to locate and correct the fault. Often, it is a matter of a cable connection not being fitted properly or the camera or strobe settings are not set correctly. Rather than being in a rush, heading out to a dive in a few minutes, you are going to do this equipment check the day before the dive. Then, you can perform these procedures in a relaxed manner, with plenty of time to get your gear sorted out in an orderly fashion. Store your prepared gear in a bag or box and charge your spare batteries overnight. Once set, go and enjoy a nice evening or just rest and dream of diving and photography. Come the next morning, you will only need a few minutes to make a final check before you go diving. It should not really be necessary, but it does not hurt—better to be safe than sorry. 1. Camera: Is the memory card inserted? Is the battery fully charged and inserted? 2. Lens: Is the lens appropriate for the task ahead? Is the lens cap off? Is the lens clean? Is the lens switched correctly to either auto-focus or manual focus? 3. Strobes: Are the batteries inserted and fully charged? Are the o-rings okay? Is the cable connected? Is the strobe firing? 4. Housing: Are the o-rings okay? Is the housing properly closed? Quickly check that your spare parts (batteries, silicone lubricant, o-rings, etc.) are in the box (or bag) and fully functional—and don’t forget a towel! Remember to turn your camera and strobes back off after the final check in order to conserve battery charge. You will turn them on again right before entering the water. Our mindset is what forms the blueprint for a general plan and how we define checklists for how we want to go about accomplishing things—the foundation for accomplishment is preparation. Although there are some basic traits that we often see reflected in the habits of advanced photographers, each individual photographer will have to form in time his or her own individual mindset. Right. We are now ready to dive, are all kitted up and our photo gear is all set. Finally, we can go and take some photographs. But hold on... Did you switch on your camera and strobes? Surely you did. But have you made any exposure settings yet? If not, let me share with you my personal choice of settings, which I use at the beginning and end of every dive: f/8, 1/125 s, ISO 200. And if I am diving with a strobe, I set it to around 40 percent power (in manual mode). I do this for a good reason. It frequently happens to photographers, even once in a while for seasoned ones, that they hop into the water, descend to just a couple of meters, only to suddenly and somewhat unexpectedly find themselves surrounded by awesome photogenic objects. Sharks, turtles and huge shoals of fish—you name it. Rest assured that photos of National Geographic caliber were not created by unprepared photographers who were fumbling about with their camera settings, fighting to get them set. Those who do tend to see their awesome models swim away and disperse before they are done messing about with their equipment. For this simple reason, it is better to be prepared and have your camera ready to shoot from the very moment you get your head under water. You never know what may suddenly pass in front of your lens while you are descending (or ascending), so you might as well be ready with proper settings just in case something exciting happens out of the blue. Having these standard settings dialed in beforehand works well in many settings. The mindset of a successful photographer stems from posing the fundamental question: What do I want? There are underwater shooters who are perfectly happy with following a guide and being in a group, content with taking some quick snapshots in different directions, and just want to see as many different things as possible during their dive. Then there are others who prefer spending their entire dives just photographing on their own, often entirely focused on only one particular subject. Such photographers tend to have an outright dislike for following groups or guides, and they are just happy hanging around in shallow waters under the boat, spending all their air, concentration and energy on the “shots of the shots.” If the latter rings familiar, keep on reading. Stop and look around. Instead of swimming aimlessly around and shooting anything that cannot swim away from you fast enough, I recommend just descending calmly a few meters while keeping your eyes open. If you have not started your dive with a plan of what to shoot, just stay put and have a good long look around you. More often than not, you will start noticing stuff you would not have noticed if you were in hurry. A lot of interesting creatures are camouflaged and not easily spotted. If macro photography is your passion, find yourself an interesting-looking part of the reef and watch out for small critters. If wide-angle photography is your chosen discipline for the day, watch out for the direction of the sun and for interesting structures and shapes. Take your time to just hang around in the blue and get inspired. Slow down. If you need to swim (say to reach the reef), swim about quite slowly. Incredible, interesting subjects might appear on your way, but if you swim too fast and do not look around, you will race right past them without even noticing. •	What camera and strobe settings might I need? •	How can I approach it? Don’t scare the subject. Keep your distance at first in order not to scare your subject away while you dial in the settings needed, and only then approach it very cautiously. Don’t rush. Take as much time as you want to create your shot. It is not a matter of quantity but of quality. And quality can never be rushed. Eliminate distractions. Another important step part of developing your mindset is to make it a routine to always seek to eliminate possible distractions and disturbances as far as it is practically possible. Think about what may interfere with your ability to fully focus on the task at hand and consider beforehand what can be done to eliminate such factors. •	Equipment paranoia – My camera or strobes are flooding! Relax, because you took your time and prepared your gear properly. •	Stress with buoyancy – Acquiring good buoyancy skills should come before taking a camera underwater. •	Fogging or flooding dive mask – Only use dive masks that work well for you. Test (and maybe replace) them until you are perfectly happy with one before you have to embark on a serious photo dive! •	Group or peer pressure – Dive with a buddy who shares or understands your passion and avoid being tucked into a dive group. Consider a private guide if no dive buddy is available. What do we do after the dive? We stay true to the same philosophy by remaining organized, preventing stress and going over our routines in a methodical and structured fashion. Keen underwater shooters always think of their photo equipment first and of themselves second after re-entering the dive boat, coming ashore or wherever they planned to get dry again. The first step is to take care of the camera in its housing. Larger dive boats and almost all shore-based dive centers will have special rinse tanks, filled with fresh water. Turn your camera and strobe off and place them in a fresh water tank, preferably in one that is specifically designated for photo gear only, as opposed to the one where people rinse their regulators or other dive equipment. If there is no such a tank, use the fresh water shower to rinse the salt water away. Saltwater itself does not damage your underwater housing and strobe, as long as it stays wet, but once it dries it is quite different matter. If there is no fresh water available, it is now time to bring out the towel. Remember the towel? That is the towel I told you to pack in your camera bag or box! Wet the towel and wrap it around your camera housing (leaving the camera still inside) and store the whole thing in a shaded and safe place. This will for the time being, and as long as the towel is kept wet, prevent the salt from the seawater on your rig from crystallizing. 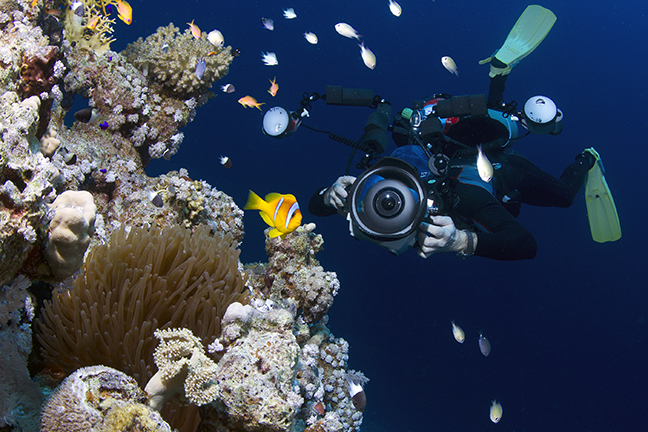 You can rinse your underwater photo gear later on, once you are back at home or in your hotel room. Never open the camera housing before you have cleaned and dried it properly. In between two dives (e.g. during your lunch break), the best place to store an underwater camera is always the freshwater rinse tank. Just leave it in there, if possible. Push each button of the housing a couple of times while the housing is in the tank. Keen photographers usually cannot wait to review their recent shots directly after the dive, often while still wearing their neoprene suit and half of their scuba gear. That is fine, but please bear in mind one thing: Don’t judge the photos by your camera’s LCD display. No matter if you shoot RAW, JPG or DNG, the camera’s LCD displays only a JPG preview in a very low resolution. Only by reviewing your photos on a computer’s larger screen AND by zooming in to 100% magnification are you able to properly deem which images are any good and which are not. Unless a photo is totally black or blurry, do not delete images directly from your camera while reviewing them on the camera’s LCD screen. Sometimes, photos that may not look promising on the LCD may turn out to have that “little extra” something, and photos that seemed awesome on the first view on the LCD, often do not appear as nice when reviewed on a large screen. Also keep in mind that the rear LCD screen draws a lot battery energy, so if you would like to review your photos between dives, make sure that you carry along spare batteries, especially when you are using compact or mirrorless cameras. Daily transfer. Once back home, you should transfer the images from the camera to a computer, regardless of whether the memory card still has space for more photos. Just stay organized and transfer your images after each day of diving. Empty the memory card to prepare it for the next day of diving. You may now charge the batteries (camera and strobes) as well. Sorting images. Create folders sorted by date, location, or a specific photographic project you are working on, and store your images in there. Once again, stay organized. Hint: Do not start transferring images from the camera to the computer if the camera battery is already low. Replace the battery before the transfer or use a card-reader. Selection and processing. At this point, you may now grab a well-deserved drink and start reviewing your photos of the day on your computer. For the first round of selection, I recommend deleting only the really bad or unsuccessful images (totally out of focus, totally black, etc). Stay calm if your RAW photos do not look like they did while reviewing them on your camera LCD. Remember that LCD cannot show you RAW images, it can show you only low-resolution JPGs, which are often somewhat altered by the camera’s own image processor. If you are out for a couple of days for diving and photography, it would be a mistake spending endless hours on post-production during your trip. Such matters are much better processed at home. Rico Besserdich is a widely published German photographer, journalist and artist based in Turkey. For more information, visit: Maviphoto.com.